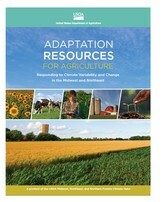 The long awaited, easy to use, Adaptation Resources for Agriculture: Responding to Climate Variability and Change in the Midwest and Northeast is now available at the National Climate Hubs website under the Adaptation Assistance menu. Add this new USDA report to your education and outreach action plans for helping producers prepare for, cope with, and recover from extreme weather and uncertain climate conditions. Read it to gain perspective on climate adaptation in agriculture and understand the general effects of climate change on agriculture and natural resources in the region. More importantly, use the resources to put climate change information into action: (Chapter 3) Adaptation Strategies and Approaches, a synthesis of peer-reviewed climate change adaptation responses, (Chapter 4)Adaptation Workbook, an adaptive management driven process for adapting agriculture to climate change, and (Chapter 5)Adaptation Workbook examples, four real-world examples that demonstrate how to use the workbook on typical farms in the region. While the Adaptation Workbook is designed primarily for use by individual famers, the rest of the report is designed for use by extension agents, ag advisors, and conservationists to enhance their climate education and training programs.